The Ask: How do you prevent a billion-dollar soft drink brand from going flat? The Reality: People love Sierra Mist but the brand didn’t own the cultural cachet that Sprite and 7up had cultivated for decades. When we dug into who was actually talking about Sierra Mist online, we discovered people already loved the brand for its confidence, curiosity and unexpectedness - it just wasn’t being celebrated yet. The Work: In an effort to break the category convention of celebrity endorsements, I lead the reinvention of the Sierra Mist brand, including target definition, brand strategy and product reformulation and helped guide the brand identity, packaging design and creative communication. In Fall 2014, Sierra Mist launched it’s new self, by delivering the ‘Make Interesting Happen’ campaign that was as multi-faceted as their target - from public art stunts and regenerative billboards to original film content and digital shorts. The Ask: How can Google Android shift from being America’s overlooked operating system to its most celebrated tech brand? The Reality: While 52% of Americans used Android products, everyday people weren’t clear on what the Android brand stood for, which meant they couldn’t be loud and proud Android fans. Android needed a way to unite their massive audience around a single idea and rally cry that set them apart from Apple’s iCult. The Work: We already knew what made Android’s audience different, but we needed to unlock what these 107MM users worldwide had in common. Through a series of in-depth quant and qual research, over 75 man-on-the-street interviews, focus groups, and social scraping, we uncovered 5 key insights that not only united the Android audience, but drove holes in the narrative of Apple as the one and only tech brand. Armed with these insights, Google Creative Lab launched the $400MM “Be Together. Not The Same” global brand campaign in the fall of 2014 giving fans everywhere a reason to stand with Android. The Ask: How can Google Jacquard break the over reliance on screens and rewrite the way we interact with wearable devices? The Work: This wasn’t about coming up with big moonshot ideas for Jacquard, it was about zooming into micro moments where Jacquard would be most useful and helpful to people in their everyday. I led a series of at-home ethnographies, closet audits, walk-alongs and bike-alongs with both Bike Commuters and Fashion Techies, giving us an in-depth look at the role of fashion and tech in peoples lives. We then identified 5 big themes for Jacquard that gave us a solid foundation to ideate upon. 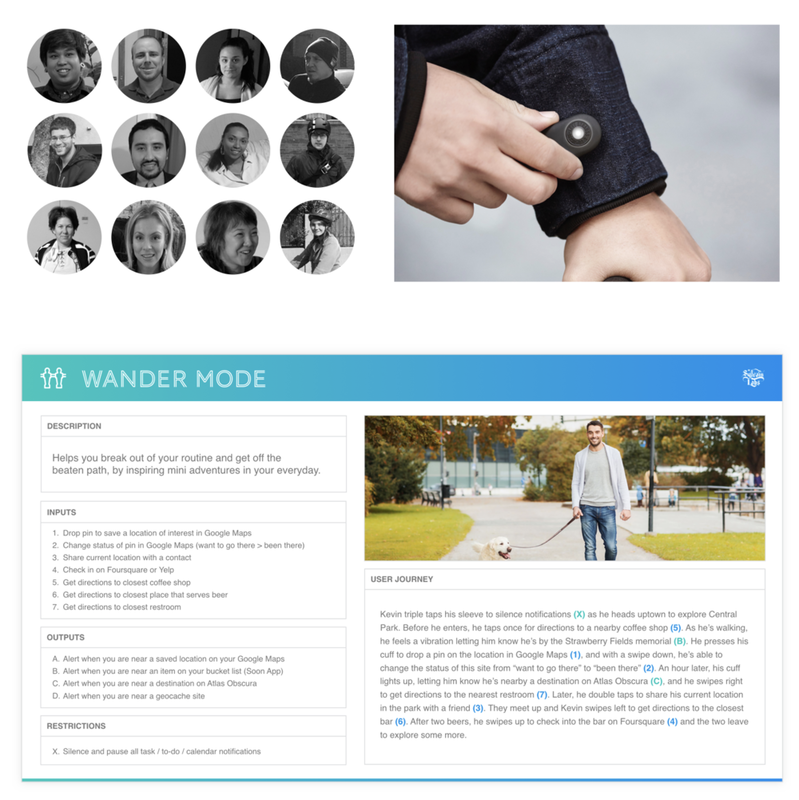 We developed 320 unique use cases and 33 customizable modes for Jacquard and, working closely with the ATAP Team, synthesized it all down to 7 core user experience modes. The Ask: How can ANN INC. strengthen its internal culture during a time of significant organizational change? The Reality: In 2015, ANN INC (including Ann Taylor, LOFT, Lou&Grey) was bought out by Ascena Retail Group. With this drastic change through acquisition and new leadership, came an emerging need to identify, preserve and grow the internal culture at ANN INC. The Work: We kicked things off by immersing ourselves fully in the ANN INC culture. We combed through all previous work, research and data at ANN INC. We read Instagram comments and Glassdoor reviews, the good and the bad. We spent a week conducting anonymous interviews with associates across every function and at every level, from the receptionist to the CEO. We sent out a companywide survey to ~1000 employees. Through this research, we were able to distill it all down to 5 core pillars of culture at ANN INC and clear recommendations for preserving the areas where culture is thriving and investing in the areas where culture is lacking. The work was met with huge success and has since been incorporated into the organizational strategy and long-term plan. The Ask: In the frivolous and fleeting world of fashion, how can UNIQLO reposition themselves from everyday basics to urban necessities? The Reality: In 2016, UNIQLO began talking about their products as LifeWear: clothes to change the way we live. However they lacked a strategy that demonstrated how this philosophy is at the core of their brand, product and technology. UNIQLO needed a strategic framework to root the LifeWear product line today and inspire the LifeWear pipeline tomorrow. The Work: I led a 6 week sprint to deconstruct what LifeWear means today, develop a strategic framework for LifeWear, and identify new product innovation opportunities. Through a rapid-fire ideation session, we generated 5 innovation territories & ~50 new product concepts to inform and inspire the future UNIQLO LifeWear pipeline. This work was proof that LifeWear as a strategic platform allows the brand to stretch and grow in infinite directions. The concepts were presented to the global brand & design team at UNIQLO and used to inspire the design and development of the SS/FW 2017 LifeWear line. The Ask: How can Speed Stick transform from bottom-shelf follower to premium innovation leader? The Reality: After revolutionizing the category with the first stick deodorant, Men’s Speed Stick had fallen behind on all fronts. As category mega-brands invested heavily to forge strong bonds with Millennial men, Speed Stick continued to launch me-too products with little marketing support. If Speed Stick was going to survive, they had to up their ante on innovation and create a line of premium products that would stand out at shelf and connect with twenty-something men who long left the brand behind. The Work: To avoid self-indulgent innovation and one-off fragrance extensions, Speed Stick’s innovation pipeline had to be built from the outside-in and from ground up. So, we designed research that took us into the homes of twenty-something men where we discovered true, unmet needs that pointed to new whitespace innovation territories. We hosted co-creation sessions to ideate with consumers, resulting in 30 innovation ideas. These ideas were then optimized before being placed in a quantitative BASES screen where 70% of the ideas received strong scores to advance towards a successful pipeline. The Ask: How do you turn lifeless data into an interactive experience that shows the human value of a network? The Reality: Juniper Networks is one of the leading manufacturers of network equipment in the world. Their company HQ in Sunnyvale, California boasts an Executive Briefing Center but it was desperately in need of a tech makeover. They wanted to build an interactive display to demonstrate the power of their network solutions and show what happens when data evokes a real, human experience. The Work: I worked with a team of designers, architects and engineers to build an interactive experience around real data in real time. I led the brand & experience strategy for the development of an interactive light sculpture - a giant chandelier in the shape of a world map made of hundreds of suspended light tubes. Standalone kiosks let viewers play, explore and interact with the sculpture through a series of data illuminations that bring to life man-made and natural events around the globe, from flight paths to earthquakes. The sculpture transforms Juniper terabytes of data into a simple experience that you can see, touch and feel. The Ask: How do you take what’s inside one man’s imagination and use it to inspire a new generation of makers and tinkerers? The Reality: It all started one Sunday when my husband & I rented a Zipcar and drove to New Jersey. We stumbled across Northlandz, a miniature train world, and were blown away by the scale and imagination of it all. We discovered it was all built by one man, Bruce Zaccagnino, and we ended up making a short film about him and his creation. The Work: Over the course of approximately 6 months, it went from a conversation in passing to a script to a shoot to a website. My husband directed the film while I interviewed and managed Bruce. With the help of Sylvain Labs and Greencard Production we cobbled together a small but scrappy budget and crew. Some Kind of Quest currently has 105K views on Vimeo. It was awarded Vimeo Staff Picks, Short of the Week and was an official selection in Buffalo International Film Festival, Anchorage International Film Festival, Borrego Springs Film Festival and Fairhope Film Festival in 2016.